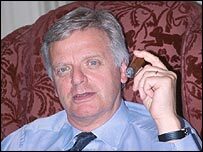 With his red braces and cigars Michael Grade is an instantly recognisable but also controversial figure. His appointment as chairman of the BBC governors comes after a long media career with the BBC and ITV before nine years as head of Channel 4. For someone who has always been behind the scenes in the media, he has maintained a high profile with the public. Mr Grade first joined BBC One as controller in 1984 and became BBC TV's director of programming in 1986. He surprised critics by dropping Doctor Who but he was also the man who launched EastEnders. Mr Grade failed in his first attempt to become the BBC's chairman in 2001 when he expressed an interest in the post. In an interview he said there were two certainties in his life. "One is that I would like to be chairman of the BBC. The second is that no one will ever ask me. I'm a bit of a strong taste, I think. Bit too independent," he added. Grade came from a showbusiness dynasty, with his uncles, impresarios Lew Grade and Bernard Delfont, a major influence. He was the son of Leslie Grade, the theatrical agent who booked stars like Bob Hope and Danny Kaye. His career began in 1960 as a trainee journalist on the Daily Mirror, where he was a sports columnist from 1964 to 1966. His father suffered a stroke when Mr Grade was 23 - an event which became watershed in his life. Bernard Delfont told him: "You've got to get serious, young man - your father's not going to be the power he was and we need you to learn the business." He consequently became a theatrical agent with the Grade organisation in 1966 and moved into TV in 1973 as deputy controller of entertainment programmes at London Weekend Television. During his time at LWT, he became friendly with one of the ITV firm's senior executives, John Birt - who later became the BBC's director general. 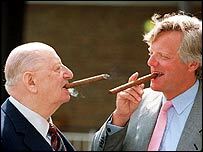 In his autobiography, The Harder Path, Lord Birt said that the young Michael Grade was "modest and honest about his handicaps, quick-thinking and street-smart". From LWT, Mr Grade moved on to BBC One in 1984, where he won many admirers. His successes included driving up the audiences for such programmes as Panorama and Omnibus by clever scheduling, while Bob Geldof said nobody else would have had "the bottle" to hand over a network for 24 hours to Live Aid in 1985. But he was not afraid to make tough decisions - like scrapping sci-fi favourite Doctor Who. In 1988 he moved on to become chief executive of Channel 4. There, he sanctioned controversial programmes such as The Word, Eurotrash and Dyke TV. Its controversial programming led Daily Mail columnist Paul Johnson to dub Grade the "pornographer-in-chief... a 52-year-old who grew not entirely to maturity in the 1960s". But he put the channel on a sound financial footing and oversaw a growth in its share of viewers. Stephen Garrett, head of production company Kudos and the executive producer of hit drama Spooks, remembers Grade as a "charismatic leader" and a "professional maverick". Mr Grade left Channel 4 in 1997 and later become chief executive of First Leisure, which operated nightclubs, bars and health and fitness clubs. He stayed there until 1999 before going on to become chairman of the firm running Pinewood and Shepperton film studios. Only this week, he announced plans to float Pinewood-Shepperton on the London Stock Exchange as part of its expansion. Mr Grade moved back towards television in 2003, becoming a non-executive director at Glasgow-based media company SMG, which runs the Scottish and Grampian ITV franchises. He also sits on the board of his beloved Charlton Athletic football club - whose south London ground, The Valley, is close to the Millennium Dome, where he was also a director. He is also chairman of National Lottery operator Camelot. Mr Grade's achievements were recognised with a CBE in 1998.